A cool blend of Cut the Rope and tower defense iOS games, the Joy Desk iPhone app challenges you to solve puzzles by manipulating office notepads filled with objects and obstacles to fall properly and earn points. It is graphically interesting and thoughtful, and the gesture controls are simply effective. The Joy Desk iPhone app’s graphics must have been designed by a compulsive doodler trapped in corporate America. In the office, you scribble an important word, and while the office droning continues about the word, you simply draw the word over and over again until each line in a letter is 1/4 inch thick. You draw arrows and lines to link like items together in your notes. You draw a star to note what is important. All of these notes are scribbled in a notepad and placed on your desk made of faux wood formica. This is the vibe of Joy Desk; however, the fun, addictive game play makes you feel subversive when sneaking in a bit of Joy Desk at work. 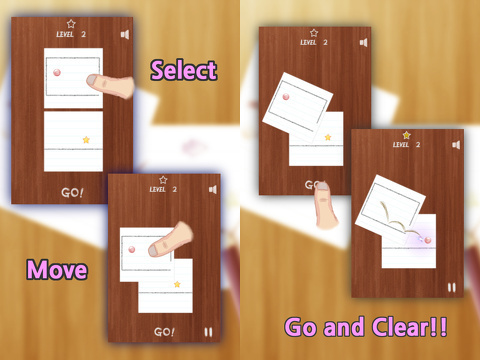 The gesture controls of the Joy Desk iPhone app are extremely agile and add dimension. It is a less active, engaging experience as Cut the Rope where you are constantly involved in the game play. But the idea of keeping items moving in the right direction and intersecting at just the right moment is a central idea of both games. That’s when the elements of tower defense games become relevant, as you set up your puzzle before pressing go. You touch the corners of the note pads to shift them, so the ball will drop in the correct direction. Since puzzles can exist on multiple pieces of note pad paper, then you drag them by touching the middle of the square to layer them. After you set up the puzzle using the responsive gesture controls, then you press go. If you are successful, your ball drops and intersects with the star. The game play is fun and sometimes unexpected. There are obstacles that may pop your ball. Another challenging aspect to the Joy Desk iPhone app are the lines that may surround each piece of the puzzle. There are holes in the line, and some are completely lined. In order to solve the puzzle, you may have to arrange multiple pieces of the puzzle in ways that seem counter-intuitive yet make sense with the physics of the game. You can also pass when stuck. 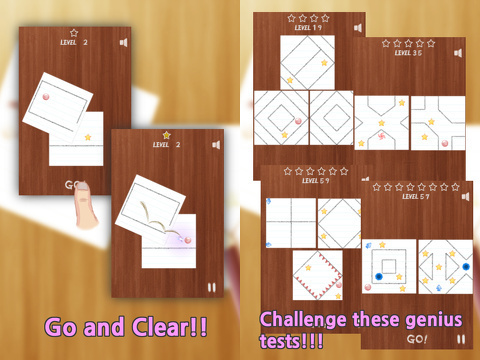 For those of us who love puzzle iOS games, it can be frustrating to not be able to break through to the next level. The ability to continue with the game without being frustrated and turning it off keeps you hooked. The Joy Desk iPhone app is a great value for $.99, as it is smart, sophisticated, and appealing. As a bonus, it may become your favorite way to get through a fairly insufferable 4PM conference call. AppSafari review of Joy Desk was written by Jenni Ward on October 10th, 2012 and categorized under App Store, Board, Games, Puzzler. Page viewed 3914 times, 1 so far today. Need help on using these apps? Please read the Help Page.